A well-attended meeting of the Board and Trail Friends considers normal needs and extraordinary expansion possibilities. 1. Minutes of November 2018 Board Meeting, accepted unanimously without amendment. Treasurer’s Report. Treasurer Steve Darling presented the draft of a Budget for 2019. In discussion, various perspectives were offered on revenue for the coming year, mowing costs, maintenance needs, and – most consequently – the possibility of contributions from FNRT-MC to an expansion of the Trail in Boscawen. As more information on these matters should be forthcoming within the next weeks, further discussion and approval of the Budget was postponed until the next meeting. 1. Maintenance. 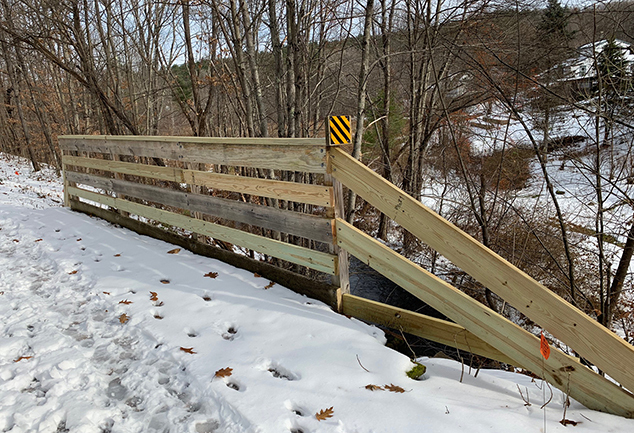 Ricker Miller reported on the successful completion of maintenance work to bridges and culverts prior to winter. An email memo from Chris Norris, supplementing Ricker’s report and laying out maintenance issues for the future will serve as input to the Budget discussion at the next meeting. 2. Mowing. After brief discussion at the Meeting, the Board received subsequent notification from Peter Southworth that he had secured a welcome proposal from Jim Shaw, a past mowing contractor. This will be taken up at the next meeting. 3. Repair of Milepost 92. The unfortunate toppling of Milepost 92 in Franklin led the Board to authorize $250 for repair and reinstallation. Alex Bernhard will take charge of this matter. 4. Contribution to the Beacon. 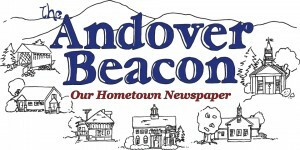 A contribution of $100 to The Beacon was authorized as input to its new page sponsorship format. 5. Website Updates. Cathe Lisk continues to update the website as necessary, and will be in touch with past sponsors about renewals. 6. Lawrence Street Tunnel, Andover. Tom Frantz reported that the Andover Recreation Committee has approved painting this tunnel, which will improve its safety and amenity. The evening’s most-extended discussion focused on the hoped-for extension of the Trail from its current terminus “at the cornfield” in Boscawen, to the Concord City Line. Jack Shields presented a schematic of the physical possibilities for Trail extension, covering both of the major scenarios now in play: 1) construction according to the TAP (Transportation Alternatives Program) grant application from the Town of Boscawen, currently pending with the State DOT ; and 2) alternative funding and construction plans, in the event that Boscawen does not receive the TAP grant. George Heaton elaborated on these envisioned scenarios by leading a discussion of alternative costs and financing. Under the Boscawen-TAP proposal, extension of the Trail to the Concord city line is anticipated to have a budget of $463,000. Eighty percent of these funds would come from TAP, with a 20% matching amount from private funds. I.e., a $92,000 fund-raising effort would be necessary. $110,00 of this budget is for acquisition of right-of-way from the Pan Am Corporation, deriving this value from a recent independent appraisal. In the event that the Boscawen TAP application is not accepted, the field is open for alternative Trail designs. ( It should be noted that the TAP grants are scheduled to be announced between January 7 and 18, 2019, according to the DOT.) As of this writing, no word has been received. With a scaled-back Trail extension to the Hannah Dustin “ramp” (i.e. Neither paved, nor crossing a bridge to the Concord line), a reasonable cost estimate of $120,000 was made. Of this, $110,000 would go toward right-of-way acquisition, which is necessary in any case. And this entire amount would have to be raised from non-TAP funds. In discussion, it became clear that a number of other developments and players intersect with FNRT-MC and Boscawen scenarios. Importantly, cooperation with the Merrimack River Greenway, to finish the extension and create a Trail that would run uninterrupted from the heart of Concord to the Vermont border, is a clear objective. In addition, development of the Governor’s budget and state transportation plans may offer assistance in the rail trail network. The Town of Boscawen, for its part, will consider warrant articles pertaining to Trail and TAP funding. Before February’s meeting, members of the FNRT-MC will monitor and reach out to those involved with these developments, and will further consider our support for extension of the Trail at that time.